Our whole family of twenty-two! I knew I would cry and I did. My daughter loved it and laughed at me affectionately. When I walked her down the isle it was a bit surreal. My grandson Josh played the piano and all my kids were there in their fine wedding clothes watching me walk my gorgeous daughter up to give her hand to Sean. But first I stepped over to him and said, “Are you going to take good care of my daughter?” He said, “Yes sir, I am!” and I put her hand in his. Seven years ago I had told him I’d break his knees if he ever touched my daughter in the wrong way before marriage. They kept their pledge and I gladly gave him my daughter’s hand. Fr. Ed Fride gave an impassioned and moving homily on the gift of God in the Sacrament of Matrimony and the importance of making Jesus Christ the center of the relationship. Even our Evangelical friends and family seemed moved by his touching homily. At the reception I gave a talk about my daughter and Sean. I explained our family rules of no dating until 18 years of age and how these two were so willing to obey and do everything right. My pride and joy was obvious according to some who commented. Many said it was one of the most beautiful, emotional and elegant weddings they’d ever attended. Here is a video of me dancing with Emily. I argued with myself if I should upload it and I decided to do it even though you see me at one of my most emotional and even goofiest moments. But at least that girl knows she is loved by her father. We danced to a song called “I Loved Her First” which was a real tear-jerker for a dad who loves his beautiful girl. You are a lucky father and she is a lucky daughter…thank you for uploading the video, it was very touching. How wonderful to see such “real” love in a family. Beautiful wedding and reception. What a beautiful bride. Thank you for sharing. Steve and Janet – what a beautiful family! Thank you for the amazing pilgrimage in the Holy Land. So very happy for you and your family. Happy Wedding Day to Emily and Sean. May their marriage be showered with many blessings and their love for one another grow with each day. God bless the newly weds! Loved the video Steve. Congratulations to your family and thank you for sharing such a beautiful sacrament. Many blessings and lots of love! 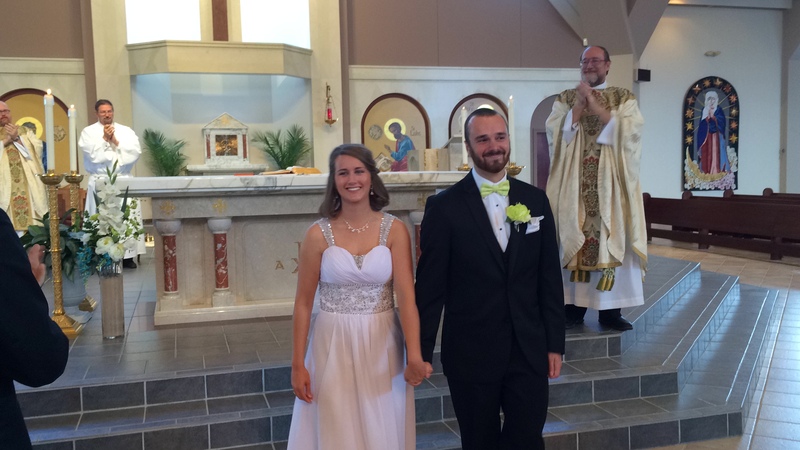 Congratulations and many blessings to the happy couple! I know how you felt. My own last and youngest daughter was married last year. Thank you again for a most wonderful experience at the Holy Land. You and Janet are truly very precious gifts to the Church. I think the reason weddings move us emotionally is that there are few other occasions where God’s love, beauty and truth are so evident. The bonds of love among members of the family–especially between fathers and daughters–seem to be a clear reflection of God’s love for us. The process of loving, teaching and nurturing children, until the time comes for them to leave home and start that process for themselves, is a marvelous rhythm within God’s creation. Like the Church, families are a framework for love. Steve, you are a good role model for earthly fathers, and that no-doubt pleases our heavenly Father. Congratulations to all, and may God continue to richly bless your family. Wow, Steve and Janet! 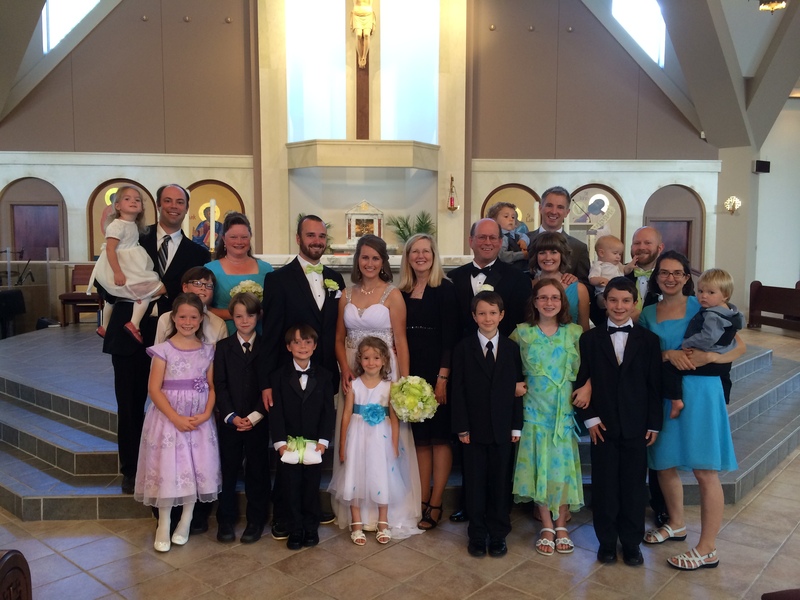 What a wonderful family, and congratulations to the newlyweds! Previous post: My Baby Girl Gets Married Today; Already have Tears Thinking of Walking her Down the Isle. Next post: If There is No Infallible Teacher, What Good is an Infallible Bible?